To Cite: Dashtebozorgh A. Chronic Bilateral Anterior Shoulder Dislocation , Shafa Ortho J. 2014 ; 1(3):e7. The most common chronic bilateral dislocations are posterior resulting from epileptic seizures, electric shock, and hypoglycemia or in emotionally disturbed patients (1, 2). Chronic bilateral anterior dislocation is rarer than posterior one and usually occurs following traumatic events (3). Chronic bilateral anterior shoulder dislocation is very rare and just few cases have been reported so far (4). A36-year-old man presented to the upper extremity clinic at our hospital due to mild bilateral shoulder pain and severely limited range of motion. Eight weeks ago after a highway car accident, paramedics transferred him to a university hospital. At ad-mission in emergency department he was suffering from dyspnea. Chest radiography revealed fractures in left side ribs and bilateral shoulder dislocation. The attending physician concentrated on the fractured ribs and bilateral shoulder dislocation was missed. The patient was transferred to the operation room for chest tube insertion. 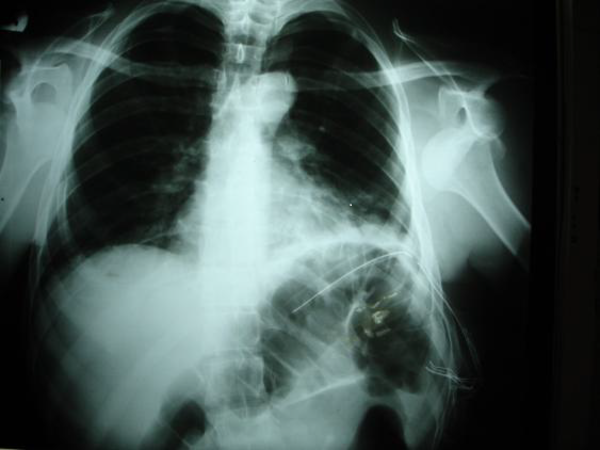 To verify the location of the chest tube and monitoring the pneumothorax, postoperative chest X ray was obtained and again bilateral shoulder dislocation was missed surprisingly (Figure 1). For five consecutive days, chest X rays were repeated for the same reason on daily base and again bilateral shoulder dis-location was missed. Six days after admission, the patient was discharged from hospital with bilateral shoulder discomfort attributed to the soft tissue injury. A couple of weeks later he sought medical attention from a local hospital where the attending general practitioner established a proper diagnosis and referred him to our hospital. At presentation, both shoulders had deltoid atrophy and range of motion was restricted severely. Radiographs from both shoulders and CT scans confirmed the bilateral anterior dislocation of shoulders accompanying greater tuberosities fracture. Electrodiagnos-tic study revealed right axillary nerve and left brachial plexus upper trunk injuries. Since 8 weeks was elapsed from the injury we did not try closed manipulation to pre-vent iatrogenic neurovascular injury. There-fore, under general anesthesia open reduction through deltopectoral approach was per-formed for both shoulders with extensive soft tissue release. Greater tuberosities were fixed by trans osseous sutures. Since his shoulders were unstable after open reduction, we fixed them in reduced position with heavy pins from proximal humerus to the glenoid. After 4 weeks we removed the pins and referred the patient to the physical therapy. After three months both shoulders had limited range of motion but patient was able to perform his self-care. Although unilateral shoulder dislocation is the most common joint dislocation in the body, simultaneous bilateral shoulder dislocations are unusual (3-5). Unlike the posterior dislocations, the anterior dislocations occurred more commonly following trauma, and it can be missed and diagnosed lately (6). Review of the literature reveals that our case is unique regarding the elapsed time from the injury to the treatment (7). To the best of our knowledge this is the longest period of this kind. It has been reported that 10% of bilateral anterior shoulder dislocations were diagnosed late (8). We believe that it is the first time that such an injury was missed by several physicians and general surgeon, even after a chest tube insertion in operation room and in the presence of at least six high quality X rays indicating bilateral shoulder dislocation in an admitted patient in a university hospital. This case again demonstrates that how easily simultaneous bilateral anterior dislocation can be missed even in presence of multiple optimal X rays and by professionals in university hospital. Therefore, a high degree of suspicion must be maintained to prevent missing the injury especially in patients with multiple injuries after high energy trauma.